Forrest E. Yaggi, 102, passed away September 9, 2018 at Oakwood Health Campus in Tell City. He was born in Tell City, Indiana on November 27, 1915 to the late Emory and Nora (Barker) Yaggi. Also preceding him in death was his wife, Katherine (Smith) Yaggi, sisters, Marie Johnson and Patricia Yaggi and brothers, Bill Yaggi, Ralph Yaggi and Edward, in infancy. Forrest was a WWII Navy Veteran. 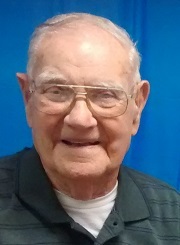 He retired from Tell City Chair Company and was a member of the Harry G. Myers American Legion Post #142, the OAKS Senior Center and former member of Hoosier Heights Country Club. He enjoyed playing golf and euchre, watching the Reds and Cardinals play baseball, visiting with family and friends. Forrest will be remembered for his kindness and generosity. Surviving is his daughter, Carolyn Harpe (Robert), Tobinsport; brothers, Maurice Yaggi (Esther), Tell City and Emory Yaggi, Cannelton; four grandchildren, Forrest Harpe (Loretta), Jean Schick (Steve), Jennifer Blixt and Diana Smith (Jason); seven great grandchildren and three great-great grandchildren. Funeral services will be held at 11:00 AM CDT on Saturday, September 15, 2018 at Huber Funeral Home, Tell City Chapel. Burial will follow in Millstone Cemetery with military rites. Visitation will be Friday from 3:00-7:00 PM and Saturday 9:00-11:00 AM at the funeral home.